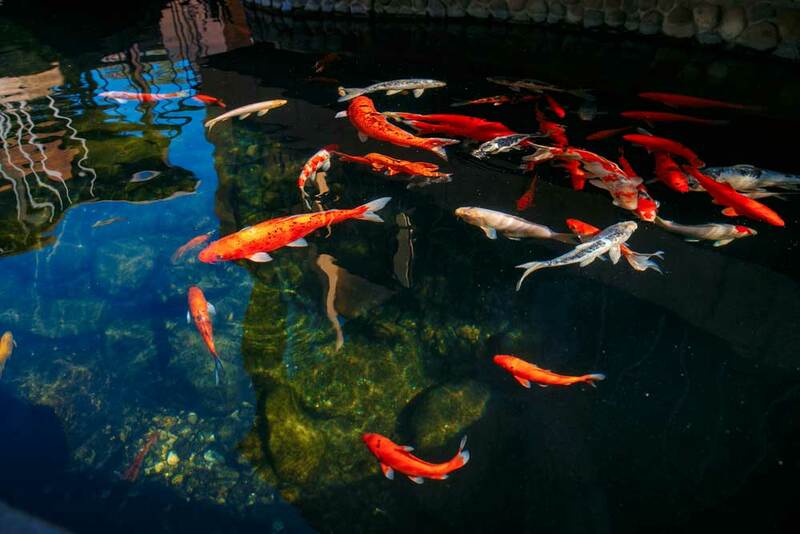 While hiring a professional is the fastest and most efficient way to clean your koi pond, there are times when you may not wish to do so. Perhaps you’re short on funds, and or you have the time and initiative to get the job done yourself. In that case, it is important to make sure the cleaning is done the right way. Below are some koi pond cleaning tips that will help. The first step in cleaning your pond is to drain it. This can be done with a sump pump, but before using it you will need to remove the frogs, fish or other animals that are in the pond, and place them in a container or pool filled with water during the draining process. Next you will need to remove the circulation system, as this will allow the water inside the plumbing to come out. Ponds collect debris and this debris will need to be removed. This should be done after the pond has been drained. Typical debris that you’ll find in ponds includes twigs or leaves. Once this has been removed you can wash the pond with a garden hose that uses a high pressure nozzle. We recommend a minimum pressure of 1,500 psi for this task. Once you’ve finished washing the koi pond, you’ll want to rinse it. To do this, you will turn down the pressure on the nozzle as this will make it easier to remove debris which is trapped under pebbles or rocks. Dirty water will accumulate near the bottom so continue rinsing until it’s gone. Most koi ponds contain filters so it is important to clean them as well. The filtrations media must be sprayed until it becomes clean and don’t forget to rinse inside the units of the filter. Once the pond is cleaned, you will now need to refill it. Before doing this, you will want to remove the pump. Once the pond is refilled, you will now want to DE chlorinate the water. This is a necessity for city water which usually contains chloramines or chlorine and should be treated before fish and other animals are reintroduced. After placing the fish back in the pond, you’ll need to acclimate them. Removing them from the pond to clean it creates stress which can lead to potential health problems. To do this, you will want to introduce the fish slowly and add the pond water gradually. If the entire process sounds too complex or time-consuming for you to undertake, it’s time you let us at Fitz’s Fish Pond tackle the cleaning project and yield the best results!